OMNIgene•ORAL for tongue provides the materials and instructions for collecting and stabilizing microbial DNA and RNA from a tongue sample. Preparation: Collect tongue samples following the recommendations provided by the researcher. Locate the MMB collection tube containing stabilizing liquid and remove the tube from the packaging. Set the tube aside on a clean surface for later use. Remove the swab from the packaging using the handle. Hold the swab only by the handle. Do NOT touch swab above the break point. Rub the tongue for a minimum of 30 seconds. Avoid rubbing the teeth. Do NOT bend swab during collection. 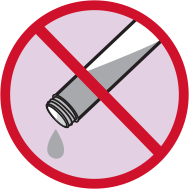 While still holding the swab in one hand, carefully unscrew the cap from the collection tube with stabilizing liquid. Do NOT touch the swab tip to any other surface. 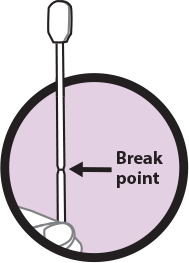 Immediately insert the swab into the bottom of the tube and snap the shaft off at the break point. The swab tip remains in the tube of liquid. Tightly screw the cap back onto the tube. If you present with oral lesions or bleeding talk to your health care professional before using this collection kit. Do NOT spill the stabilizing liquid in the collection tube. Wash with water if stabilizing liquid comes in contact with eyes or skin. Do NOT ingest. Do NOT lay the swab tip down or touch any other surface once it is removed from the packaging. Do NOT eat, drink, smoke or chew gum for 30 minutes before giving your sample.